A game to help impulsive children think before they act. In this ever-popular board game, active, impulsive children learn motor control, relaxation skills, how to express their feelings, and how to problem-solve. The manual includes information on how the game can be used both as a diagnostic and a treatment tool, and how behaviors learned in the game can be generalized for the home or classroom. The object of the game is to proceed through the Feelings, Stop, Relax, and Think sections of the game board to Finish, collecting chips along the way. The player with the most chips when the game ends wins. By Becky Bridges, C.S.W., A.C.P. Feelings When a player lands on a Feelings Card space he/she selects, reads aloud, and answers a Feelings Card. This section helps children become aware of their feelings and the early signs of stress, which is essential to their achieving self-control. Stop When a player lands on a Stop Sign space he/she rolls the 8-sided die. He/she then refers to the corresponding number on the Stop Card, performing whatever action is stated on the Stop Card until the person on his/her right says "Stop." If the player stops immediately he/she receives a chip. This section helps children practice behavior cessation and learn how to catch themselves before they respond or react automatically. Relax When a player lands in the Relax space he/she does what is indicated on the space. This section helps children learn to relax. The ability to relax is a powerful asset for a child who is attempting to learn self-control. Think This section helps children think through problems. This ability is a prerequisite to achieving self-control. quick, easy service and my son loves playing the game. the price was even better than amazon, which was a great little surprise. Love this game. Covers three areas of social emotional development. The kids love it! 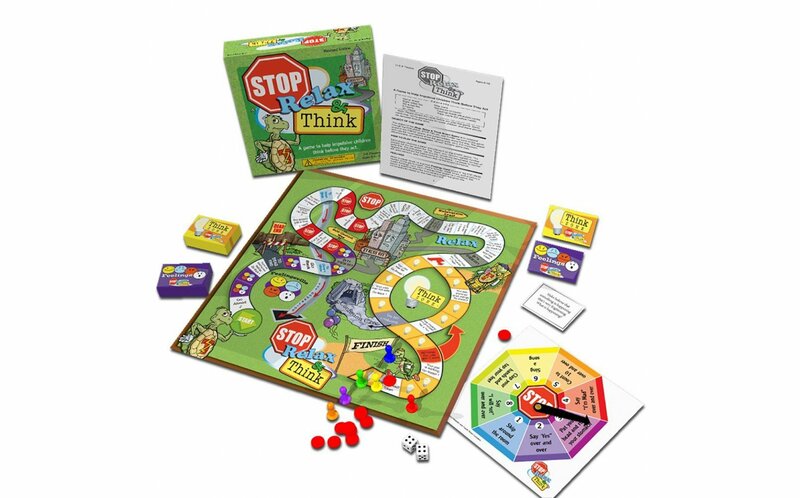 Stop, Think and Relax is a great game to encourage emotions identification, coping, and thinking through choices. I have used this game throughout my career and now I have my own copy.